On Friday, February 20, 2015 I’ll be leading a quilted petticoat workshop at Historic Burritt on the Mountain in Huntsville, Alabama. This sewing class is part of the preconference workshops for the regional meeting of the Association of Living History, Farm, and Agricultural Museums. In June of 2012, ALHFAM awarded me a fellowship to attend their national conference at Hale Farm and Village in Ohio. It was an amazing experience and I felt very fortunate to have been a part of it! So, I am giving back the best way I know how by offering this MATERIALS FEE ONLY workshop at their upcoming Southeastern regional symposium. It should be lots of fun and I am excited to have the opportunity to teach others how to sew! I hope this is just the first of many workshops to come! For more information about this conference please contact Pat McMillion at Historic Burritt on the Mountain. This entry was posted in 1820s, 1830s, 1840s, 1850s, Historical Sewing, Opportunities, Reproduction Fabrics, Symposiums and tagged ALHFAM, Association for Living History, quilted petticoat on January 30, 2015 by Susan. To my absolute surprise and wonderment, I am excited to announce I have been awarded a fellowship from the Association for Living History, Farm and Agricultural Museums to attend their 2013 international conference at Hale Farm and Village in Bath, Ohio! I cannot wait to meet other museum professionals who share my passion for rural heritage! Awesome! … I grew up in Northeastern Ohio- not far from Bath. My passion for history and living history was born from a childhood visit to Hale Farm and Village when I was six years old. It was a trip my mother took our Brownie girl scout troop on. I still remember the childhood excitement of getting to “visit the past” and all I knew was I really wanted to live on that farm too. I also remember the sadness I felt when we left and did not understand why we too could not keep livestock and dress like the interpreters. A few years later, our family moved from Ohio to Tennessee. However, my childhood experience at Hale Farm would serve as the cornerstone of a life long path. And so for the first time in over 20 years, I’ll be headed to my old stomping grounds! I wonder just how Southern I have become? I’m sure I will find out! Getting up close and personal with dairy cows and the proper way to milk ’em! 18th century chocolate making- from roasting your own beans to creating creamy chocolaty confections! And now off to work on orders so I can reserve a little time to stitch something up for myself to wear at the conference! This entry was posted in Opportunities, Research, Symposiums on April 26, 2013 by Susan. Looking for a career in Costume? I stumbled upon this site the other day. There’s multiple job postings across the nation. All levels- from costumed character positions, summer internships at Colonial Williamsburg’s dressmaker’s shop, and full design positions! This entry was posted in Costume Design, Fashion History, Opportunities, Research on April 18, 2012 by Susan. Q: First of all, what are your recommendations for pursuing my interest in fashion history? As you have already realized, compared to other professions, careers in fashion history are far and few in between. However, they are not nonexistent. Fashion History careers range from living history interpretation to museum curatorial work to teaching. I would suggest joining The Costume Society of America. They have lots of great academic/professional conferences and do list job openings in the field of fashion history across the nation. Q: What are your recommendations for pursuing my interest in fashion history? I have not found many graduate programs in the country for this subject. Do you know of any programs out there that I may have missed? UNC- Chapel Hill has a great program in costume. You may wish to check out Kent State University in Ohio. And, Ohio State has a a highly reputable film school. Q: And if not, are there certain books that you could recommend to me (I’m sure there are hundreds) that would give a good general overview on fashion history? Survey of Historic Costume by Phyllis Tortora and Keith Eubank. It is a very broad overview, but it is a great introductory to the history of western fashion. The Janet Arnold pattern books are great for looking at historic garment construction. But my favorite is Costume in Detail 1730-1930 by Nancy Bradfield. Q: Your website mentions employing ‘historical sewing techniques’. Can you expound upon that for me? You also mentioned in your artist statement that you are a self-taught seamstress, so I was wondering if you had taught yourself all of these methods or if they were learned at some sort of institution. Historical sewing techniques primarily refers to the cut and draping of a garment that is consistent with the period from which it originates. I do also try to use as many actual period stitch applications as possible when making historical garments. However, there is a fine line between “sewing historically” and making reproduction historic garments. Many historic sewing techniques require hours and hours (and hours….) of hand sewing. This is OK if you have lots of time and are creating say a couture art piece. However, when making garments for resale (or under deadlines), this is just not always feasible. Therefore, I try to replicate historic construction techniques as closely as possible when appropriate. I learned about period sewing techniques by looking at original garments (in person and in books) and then I just went into my studio and tried to replicate what I saw. As for sewing in general, my mother taught me to sew when I was 13 and in college I worked in the University costume shop. Q: Do you purchase the fabric for your garments at a general fabric store? Or do you go to a specialty store or order online? In the past I experimented with purchasing materials online and have had a mixed experience. Sometimes I got what I expected, sometimes I did not. Many online retail fabric stores purchase lots of discontinued fabrics and tend to run out of your fiber before they can process your order. Right now I work exclusively with two wholesale distributors here in the US. One specializes in reproduction cotton prints. Q: Are they worth the time and money when constructing a period garment, or can they easily be replaced by modern-day substitutes? It depends upon your intended end use. I am a historical costumer who specializes in authentic period attire. My primary clientèle is museums. If I were creating something say for theater, I might be able to use substitutes. However, it is my personal opinion that spending the extra money to purchase high quality, period appropriate fabric is worth it. I am serious believer in doing things right the first time because if you don’t, you will only have to go back and redo them again later. Q: As for your patterns, do you draft them yourself? Are they altered from patterns you have collected over time? Or do you use patterns you have found in books, on the web, or at stores? When I first began over 17 years ago, I primarily altered commercial patterns I had in my collection because they were already graded to fit different sizes. Now, I have a more in depth understanding of pattern drafting/size grading and am able to work from my own patterns. This has allowed for greater creativity in my designs. Q: How did you began this career as a freelance historic costumer? I realize it is not your only method of income, but how did it all begin? I do not think I chose a career as a historic costumer as much as it chose me. My fascination with historic clothing began when I was about five or six. In elementary school, I used to sketch Edwardian style dresses instead of doing my lessons. In middle school I made my first dress. In high school I sold my first dress. In college I studied History and Historic Textiles. I also studied abroad and worked in the theater’s costume shop. I earned degrees in History and the Visual Arts and then went on to earn a Masters degree in Visual Arts Education. In 2000, I launched my website. Since then, I have devoted most of my time to the study of historic dress and began developing my own designs based upon my research. I also teach part time at the local university. Q: Did you know people in the film industry that would frequently commission costume pieces from you? Also, do you know anything about being a Historic Consultant for films/plays/etc. My website has been my main source for business. Yes, I do network within the film and theater industry but the majority of my work comes directly from my website. Publishing scholarly articles about historic clothing and displaying images of my work online has been my biggest asset. Get connected– network amongst professionals already working in the field. Find a mentor if possible. Stay active– Read, research, learn, and create! Create a portfolio– design and create four or five garments that are exclusively your own and make them available for view by professionals already working in the field. Promote yourself– Let people know you are out there and are willing to work! Be business savvy– Knowing how to recreate historic clothing is important, but knowing how to run a business is imperative! I hope this gives you a little direction in your pursuits! This entry was posted in Costume Design, Fashion History, Opportunities on March 13, 2012 by Susan. This morning I was honored to have the opportunity to meet Rebecca Eaton (Exec Producer of PBS’s Masterpiece) and hear her speak about her 25+ years as producer of the series (and specifically how Julian Fellowes’ Downton Abbey has come to change the status of Masterpiece Classic). 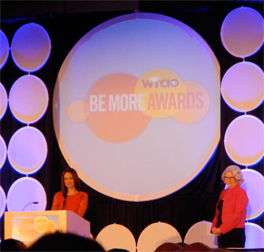 Rebecca Eaton and self proclaimed “Anglo-file” was the keynote speaker for this year’s PBS station’s “Be More” awards- a series of awards given to local nonprofits as recognition for their work within the community. However, it was Rebecca Eaton whom I specifically came to hear and really had no connection to the awards ceremony at all. First of all I must tell you that Rebecca Eaton is completely unpretentious, unbelievably real, and quite honest! She is funny and intelligent. Her speech didn’t really seem like a speech- but more of a conversation amongst friends. 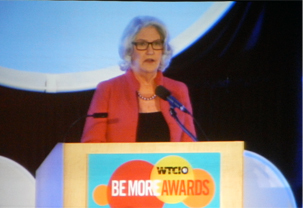 She spoke of her humble beginnings at her local PBS station in Boston (where she still works) and of her background. Her father was an expert in Shakespeare and her mother was an actress. She was a English major and thus it seemed as if a position with PBS was a natural fit. Over the years she has worked with several individuals whom we now consider acting icons- Helen Mirren, Maggie Smith, Judy Dench, Hugh Laurie, Kenneth Branagh, Laura Linney, and Jillian Anderson just to name a few. She talked about personalities and gave insider info about what it was like to work with some of these favorites. For example, she noted how outstanding Jillian Anderson is in all the pieces she works on, how funny Hugh Bonneville is, and how kind and passionate Dan Stevens (or “the man with the azure eyes”) is on set. She talked about how estranged Elizabeth McGovern felt on the set of Downton Abbey as the only American actress in the cast. She talked a bit about how the Masterpiece series comes to be. She works with a very small staff- only 8 people including herself out of her office in Boston. All of her productions are filmed in Europe (primarily in conjunction with BBC.) She spends hours reading scripts, looking over “bibles” (or the generalized plot outlines which details a production’s premise, setting, character profiles, and story continuity), and says she watches a lot of British programming. Masterpiece then either picks up these British productions and airs them on American television or acts as co producers for upcoming productions (as they did with Downton Abbey). When acting as a co producer, Rebecca Eaton actually works on set. Interestingly enough when she first read the generalized synopsis for Downton Abbey, she said she was not overly impressed. She says she was on the fence about it. It was not until she received a call from Simon Curtis (Elizabeth McGovern’s producer husband) who urged her to peruse Downton she gave it further thought. And, once she found out Maggie Smith had been cast, the deal was sealed and Downton began production in 2010. She talked a bit about the set- all the furnishings are period to the house and none of the actors or actresses are allowed to sit on the furniture unless the scene calls for it. There is absolutely no food or drink on set. When Downton is not filming, the house is open to tourists and looks exactly the way it appears in the series. However, the downstairs scenes are filmed an hour away at a film stage. Nothing remains of the house’s original downstairs as it has been converted into a gift shop. The popularity of Downton Abbey has skyrocketed Masterpieces’ ratings by 35%. But more importantly, it has brought in a younger audience (those in their 20s and 30s)- which will ultimately lead to the preservation of the series’ future. There are several new, more youthful productions scheduled for release this spring- including Sherlock, Inspector Morse, and an dramatic new interpretation of Charles Dickens’ unfinished The Mystery of Edwin Drood. 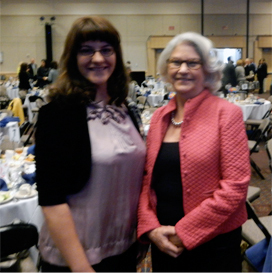 I have always been a fan of PBS’s Masterpiece but after having the opportunity to meet Rebecca Eaton and hear her speak with such passion about her work, I will forever be a Masterpiece fan. Thank you Ms. Eaton for your brilliance and revolutionary vision, and for introducing Masterpiece to a whole new generation! This entry was posted in Opportunities on March 6, 2012 by Susan.